O2 has added the Motorola Motorizr Z8 to its range of contract phones and, if you're willing to shell out £35 a month on a contract, you can get it free. 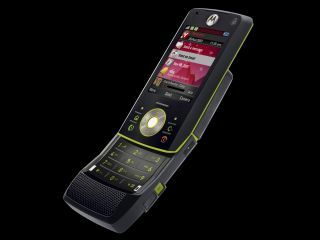 The Motorola Motorizr Z8 - dubbed the 'banana phone' - has a two-way kick-slider mechanism that fits the phone around your face. It has 3G with HSDPA for high-speed data downloads and web browsing, and is a sophisticated smartphone powered by the Symbian UIQ operating system. The Motorola Motorizr Z8 delivers an impressive multimedia performance - video record and playback is great, and its MP3 player is top notch. It can take MicroSD cards with up to 4GB capacity, too. A 2-megapixel camera ticks the right boxes for imaging. And, as a bonus, the Motorola Motorizr Z8 is being packaged with Motorola's round-the-neck Motorokr S9 Bluetooth Stereo Headset , worth £80.